There’s been a sudden influx of new French bistros in town and La Marmite is one of the most popular ones. Situated near the western boundary of Soho, this two-story restaurant is the newest venture to come from Aqua Group. Guests can enjoy a casual and informal meal around the high tables at the front, or a more serious sit-down feast inside the bistro and on the upper level. 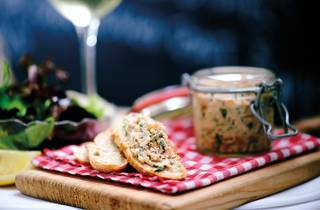 The focus is on authentic, hearty Parisian dishes at very affordable prices for the Soho area with hors d’oeuvres and desserts clocking in below $100 and main courses below $200. We arrived on a weekday afternoon for a casual light lunch and were seated on the nearly-full ground floor. The à la carte menu is quite simple with only six to seven options provided in each course section, together with a weekly recommended blackboard special. To start, we went with the potted smoke salmon ($98). 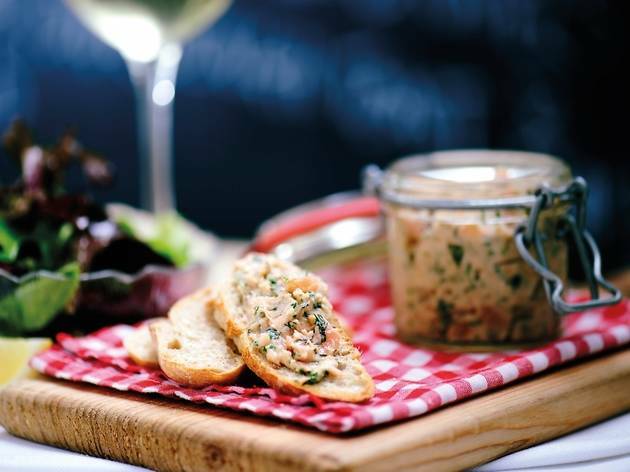 Served in a sealed small bottle, the salmon was hand-chopped into small, chunky bites and seasoned with capers and dill to form a delicious mixture, designed to be gulfed down with the crispy sour dough toast that comes with it. It’s a light and pleasantly appetising dish to start off the meal. the light and slightly gamey rabbit confit and carefully balanced port wine sauce. This delectable dish requires about 20 minutes to prepare, so make sure you have an equally laissez-faire attitude when ordering this. 46 Staunton St, Soho, Central, 2803 7808. Mon-Fri 11.30am-10.30pm & Sat-Sun 10am-10.30pm. Meal for two: around $800.